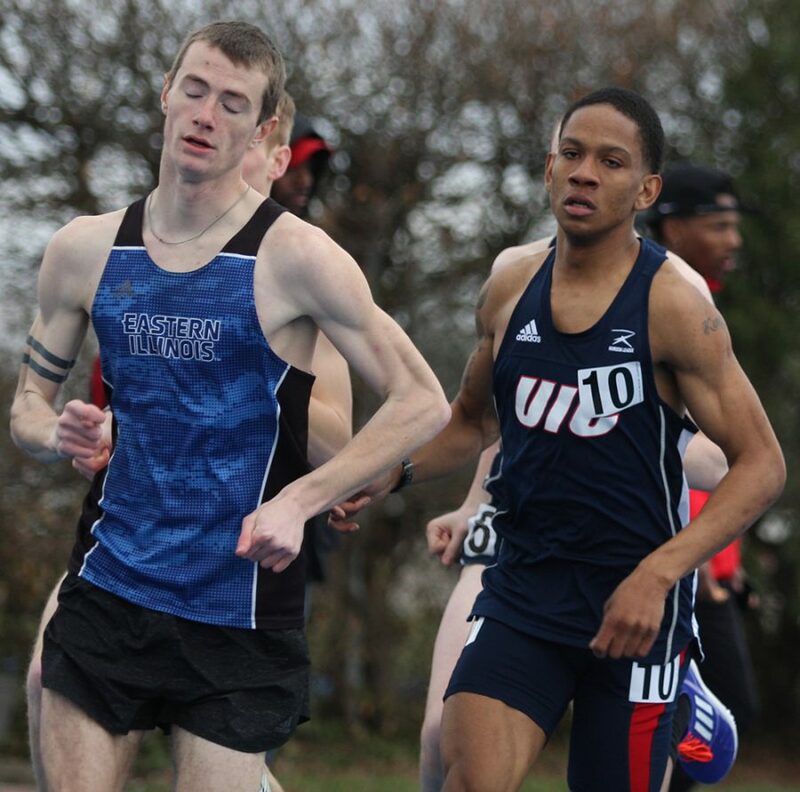 File Photo | The Daily Eastern News Joe Carter competes in the 1500 meter run during the EIU Big Blue Classic in March 2018 at O’Brien Field. Carter finished 18th in the event. The Eastern track and field program competed hard in the Notre Dame Meyo Invite, finishing the meet with 13 top-20 finishes. Those results and personal bests are all confidence boosts to build on throughout the season’s progress. Among those thirteen top-20 finishes was a bit of history off an individual personal best. Senior Joe Smith finished second in the men’s triple jump finals, posting a 50 feet and one inch jump. That jump would place him 6th in Eastern Illinois history and second in the Ohio Valley Conference. In the field events sophomore Makenna Wilson earned a 13th place finish with her throw of 56-00.50. Senior Jasmine Woodley’s throw of 55-09.25 finished 14th. The quartet of senior Pedra Hicks, junior Sophia Keith, freshman Rylei Jackson and graduate student Kristen Dowell earned the women’s best finish of the day with a 13th place finish in the 4×400 meter relay with their time of 3 minutes and 57 seconds. Dowell also earned a 20th place finish in the 400-Meter Run at 57.13 seconds. Freshman Jekeel Suber finished 11th in the 60m hurdle semi-finals, crossing the line at 8.3 seconds. Sophomore Tadiwa Mhonde finished in 13th place in the 200-meter dash, crossing the line at 22.15 seconds. Nick Phillips took 14th in the weight throw with his throw of 55-03.75. Ricky Owens took 18th in the 60-meter dash semi-finals, crossing the line at 7.11 seconds. The last two weekends the Panthers have competed in some great facilities. Last weekend the Panthers competed at University of Iowa, and this weekend was in Notre Dame. Emmanuel has been wanting his athletes to take advantage of these facilities and compete hard in each event. Last weekend the Panthers earned 23 top-10 finishes. This weekend’s 13 top-20 finishes came against schools such as Notre Dame and Louisville. The Panthers are looking to use these competitions to keep gaining confidence and momentum going further into the season. The Eastern track and field program will compete next weekend at the Grand Valley State Big Meet. The Panthers will compete on Friday in Allendale, Michigan.